Although this is really just one example of what can be achieved via the SQ2 configuration system, it's a lovely instrument in its own right. Capable of holding its own as a main snare with a little stroke accuracy, it stacks up well as an auxiliary snare, although the price puts it towards the higher end of the second snare market. That said, with a little judicious option-trimming on the SQ2 system, you too could configure your dream drum. Immaculate fit and finish. Projects well in a band setting. Quite expensive if it were to become your second snare. Imagine, if you will, the drum shop of the future, where your every whim, however outlandish, can be catered for. Want gold-plated hardware? No problem. Shells that increase in thickness with diameter? Easy. How about exotic wood finishes, inside and out? You got it. However, it's no futuristic pipe dream - by the power of the interweb, Sonor promise to make your dreams a reality. Sonor have taken the notion of customer choice to the Nth degree through their SQ2 system - essentially you can choose every aspect of your drum (aside from shape - no Staccato shells here!) and put together your dream kit via their online configurator. This drum has been put together for Bonners of Eastbourne to sell, so treads a tasteful middle ground between convention and custom. If you want to see the specifics of the options selected, plug in the code '4024724' into the SQ2 website. 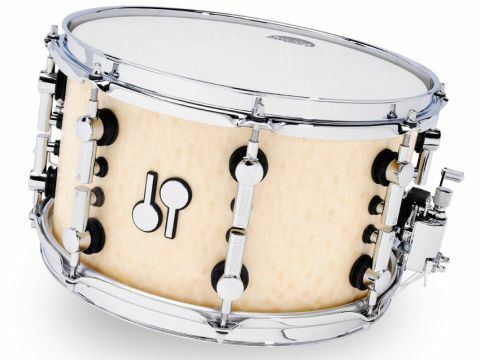 Featuring a birch 4-ply 'Vintage' 12"x7" shell with re-rings, finished with a semi-gloss birdseye maple external veneer ply and chrome hardware, it displays elegant restraint, rather than a 'child in a sweetshop' raid of the options. The semi-gloss finish allows the figured maple veneer to glow through, almost creating a 3D moire effect. The bright chrome hardware sits on typically teutonically-engineered gaskets to increase shell resonance, and the medium weight single-ply coated batter and clear resonant head work with the 16-strand snares to give a distinctive voice. At a medium tuning the drum would work well as a main snare, the thin shell projecting well in a band setting. When tensioned up, the independently adjustable snare strainers help to prevent choking. Backed off, they work with the birch shell to give a pleasantly woody fundamental note with easily-controlled overtones.